Take-off Magazine, Russia: The Russian Helicopters holding company’s subsidiary Rostvertol, which marked its 75th anniversary on 1 July this year, continues full-rate production of the world’s most capable heavy-lift helicopters – the Mi-26 and Mi-26T/TC – and has launched manufacturing of the upgraded Mi-26T2. A strong impetus to ramping up the output of Mi-26 family helicopters was given by the governmental order for 22 machines for the Russian Defence Ministry, which was awarded in 2010. The first two aircraft under the contract were delivered in October 2011 and two more followed suit late in the same year. During 2012, as many as six Mi-26s were made under the governmental defence acquisition programme. Four more were fielded with a combat units last year. Another three have been manufactured and already delivered this year. Early last year, a new Mi-26T was delivered to a Russian commercial operator. The machine (RA-06255) was made in late 2012 and delivered to the Rostvertol-Avia airline that had operated three aircraft of the type. In recent years, Rostov-on-Don-built heavylifters have been exported as well. For instance, three Mi-26Ts entered service with the Venezuelan Army Aviation in 2007-2008, while three Mi-26TC helicopters were shipped to China in 2007-2010. Two Mi-26TC machines are in the aircraft fleet of Chinese air company Qingdao Helicopter, with one more being used by the Flying Dragon operator. 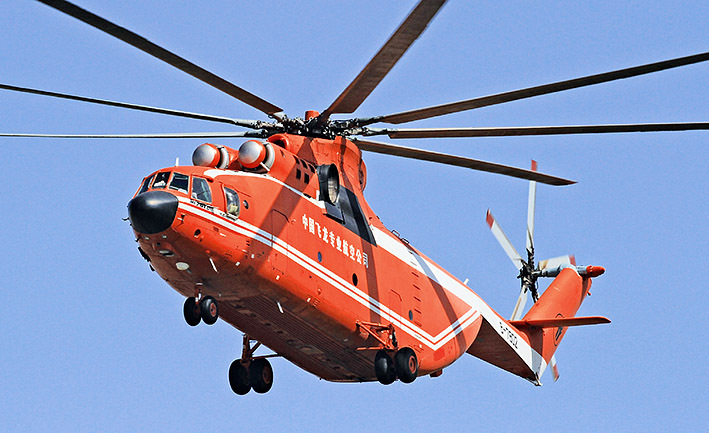 Early this year, the Russian Helicopters holding company announced its snagging a new order for the fourth Mi-26TC for China. The machine was ordered by Lectern Aviation Supplies. It will be delivered in 2015 and operated in support of the forestry service of Shandong Province. According to Rostvertol’s 2013 annual report, the company’s upgraded Mi-26T2 foreign-market promotion efforts came to fruition when the first export deal was clinched on 26 June 2013 for six machines for Algeria. The construction of the first two production-standard Mi-26T2s is in full swing in Rostov-on-Don. The key difference setting the Mi-26T2 from the production-standard Mi-26 and Mi-26T/TC is its advanced digital avionics suite that has allowed slashing the flying crew from four to two (from five to three, if the external cargo sling is used) and simultaneously improved reliability, flight safety, helicopter’s stability, controllability and hover precision, which is especially important when using the external sling. The BREO-26 avionics suite of the upgraded Mi-26T2 is based on the NPK-90-2 flight navigation system comprising the digital display system, control panels, airborne computer, satellite navigation system and digital flight system. In addition, the Mi-26T2’s avionics incorporates an up-to-date communications system and an airborne flight recorder system. Just like its baseline model, the Mi-26T2 can haul outsize cargo and vehicle weighing a total of 20 t in the cargo hold or at the external sling. Its military version carries 82 troops and casevac variant airlifts 60 casualties. The machine can perform installation and construction work of varying degrees of complexity, fire-fighting missions, quick fuel delivery, self-contained refuelling o vehicles on the ground, etc. A Mi-26T2 prototype (tail number 901) was made by Rostvertol and submitted for its flight trials early in 2011. To date, it has passed all of the key phases of the trials and Mi-26T2 entered full-rate production.